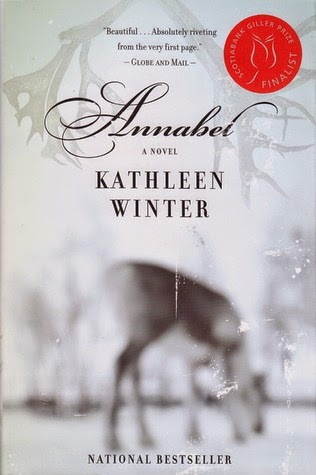 This month's book choice was Annabel by Kathleen Winter. Beth hosted and was present along with Beth, Betty, Carla, Janet, Jolene, Linda, Michèle and Shirley. Beth had some wonderful smoked salmon hors d'oeuvres, cheese, olives and very interesting marinated green beans. She served an upside-down apple cake with whipped cream along with coffee and tea. Annabel is a story about an intersex child born in Labrador to Jacinta, a teacher from St. John's, and a trapper, Treadway. The couple decide to raise the child as a boy and name him Wayne. When Wayne is a young child Treadway works hard at raising him as a boy but Jacinta and a close friend Thomasina, the midwife, quietly nurture his female side. When Wayne reaches puberty a medical emergency forces the parents to tell him about his birth. As a teen and young adult, Wayne lives a conflicted life and his move to St. John's and events that happen push him to face his dilemma and he makes a decision of whether he will live the rest of his life as a male or a female. The definition of true hermaphroditism is a medical term for an intersex condition in which an individual is born with ovarian and testicular tissue. There may be an ovary underneath one testicle or the other, but more commonly one or both gonads is an ovotestis containing both types of tissue. While most members thought the book was well written and that there were many interesting aspects, it is not a book that anyone particularly enjoyed or would recommend to others. Almost all mentioned that it was a sad story with little hope. All appreciated the descriptions of life in Labrador and Ms. Winter's description of the landscape allow us to visualize how the land is beautiful and desolate. There are several themes that are developed in the book, from the isolation from what trappers experience when they spend the winter on their trap lines, to the women who find themselves alone while their husbands are away, to the isolation Wayne feels as he is shunned by other boys, classmates and bullies in St. John's. There is also the theme of gender identity and the roles of men and women in society. There is a defined difference between the roles of the men and women especially in the 1970's when this story is situated. There is the internal conflict that Wayne feels even before he is told about his birth. He wants to please his father Treadway but has more affinity with his mother. When he and his father build the bridge, he with his female friend Wally decorate it but Treadway destroys it, feeling he has not managed to build a bond with his son. We also discussed how the different characters in the book changed and developed. Treadway, who was not particularly sympathetic at the beginning, comes to understand and support his child. He was especially supportive when Wayne as a young adult had to make difficult decisions. Jacinta, Wayne's mother, though she agreed to raise him as a boy as Treadway wanted, secretly longed for the daughter she would have wanted. Jacinta however, seem to disappear as she became depressed and isolated. Bridge could be seen as a metaphor. Thomasina, Jacinta's good friend and midwife sends Wayne postcards in her travels, always of bridges. Is there a message in these bridges that Wayne must find a way to build a "bridge" between his male and female sides of his body and mind? As is usually the case, with a book that not all particularly enjoyed, it created a very good discussion.